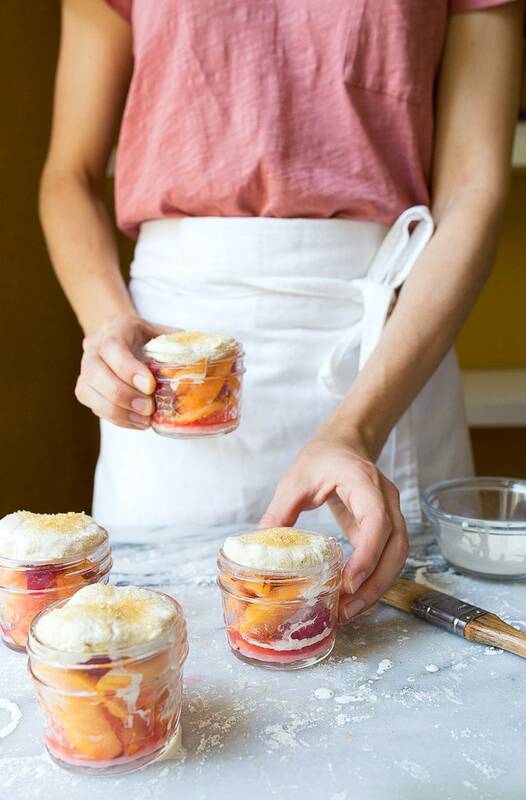 Raspberry Peach Cobblers in Mason Jars! This post is sponsored by The National Frozen and Refrigerated Foods Association, also known as NFRA. See EasyHomeMeals.com for more recipes & tips. I’m in a stage in my life where I need desserts in my purse. I’m not entirely sure what this says about me, but in the past week, I have eaten a ‘purse dessert’ in the park after a picnic with my Camille, in line at the library, and in the backseat of my car while my realtor shows my house to a potential buyer. (It helps ease the anxiety associated with strangers in my house that might not take their shoes off before entering). I have big plans to expand my purse dessert-eating pursuits, and I started with these mini cobblers in mason jars. Let them cool slightly before packing, of course. Portable desserts might be my new favorite way to get through life. And if you share your portable desserts, beware that you will make loads of new friends. I mean, if I saw a lady in public pull a dessert out of her purse and start eating it, I would try to strike up a conversation with such a wise woman, wouldn’t you? You just know that someone has life figured out when they plan ahead and bring dessert everywhere. This cobbler recipe serves two, even though I’ve divided it into 4 mason jars. Each mini mason jar holds about 3 bites of dessert. That’s just not enough for me, man. I’ve got bigger needs than that. 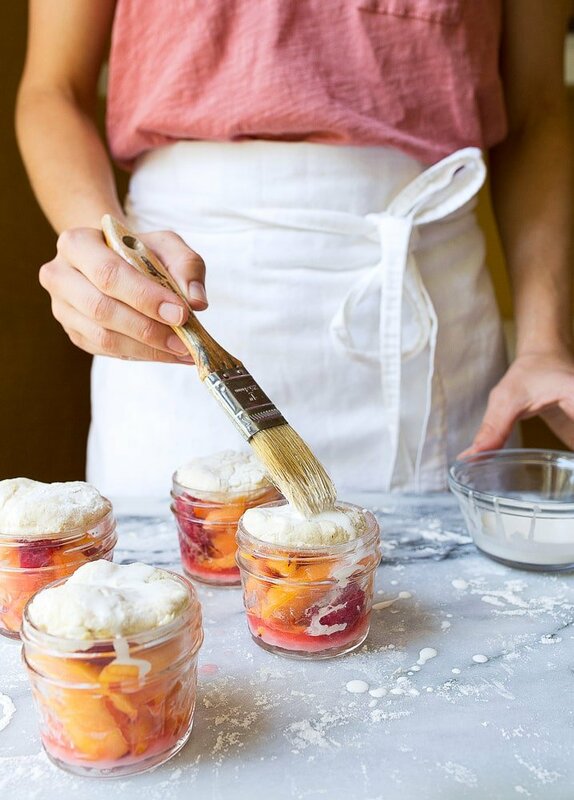 Raspberry peach cobbler in mason jar needs, you know. However, if you don’t need cobbler portability, you can absolutely make this recipe in a small 1-quart baking dish, like the one I used for my chocolate cobbler. Just dot the biscuit mixture on top of the fruit and you’re set. You’ll be happy to know that I used almondmilk to make the biscuit topping for the cobbler here. 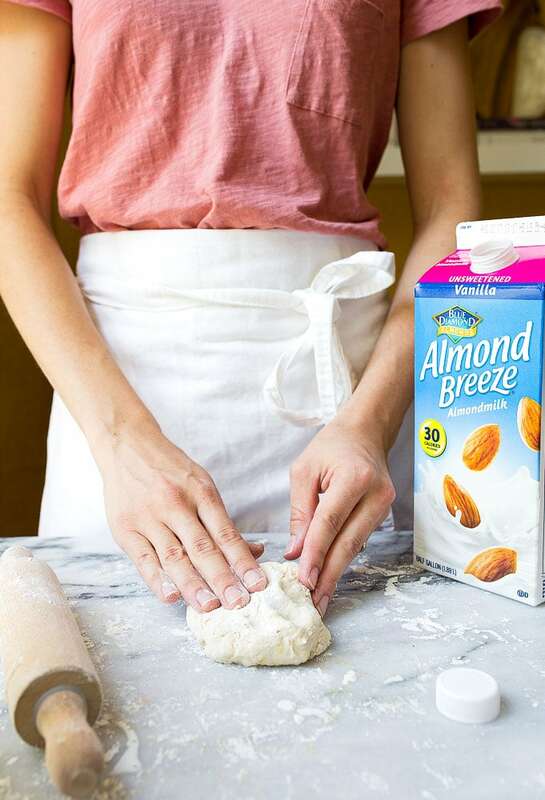 I’m a big fan of almondmilk these days, because it’s light, slightly sweet and super creamy. Oh, the versatility of almondmilk! I used Almond Breeze Unsweetened Vanilla to make the biscuit dough, and to brush on top before baking for a nice golden brown crust. 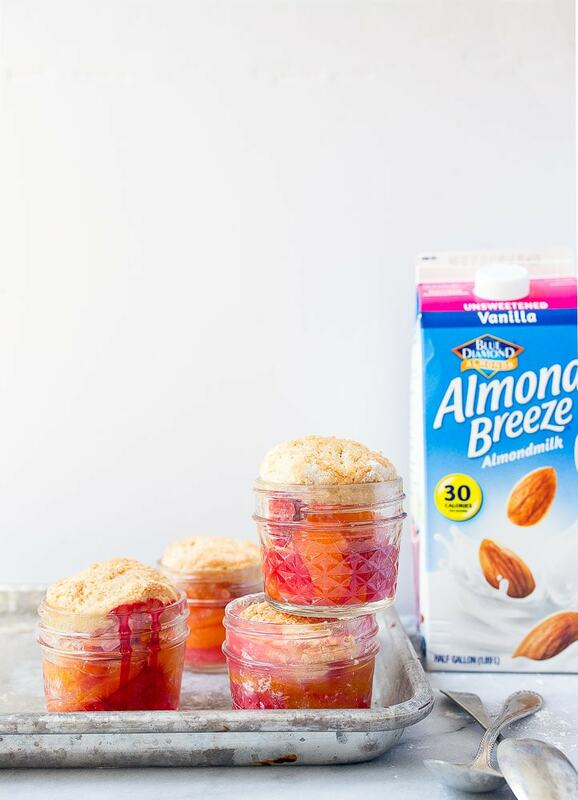 Plus, almonds and stone fruit go together like a mom and a well-packed diaper bag. 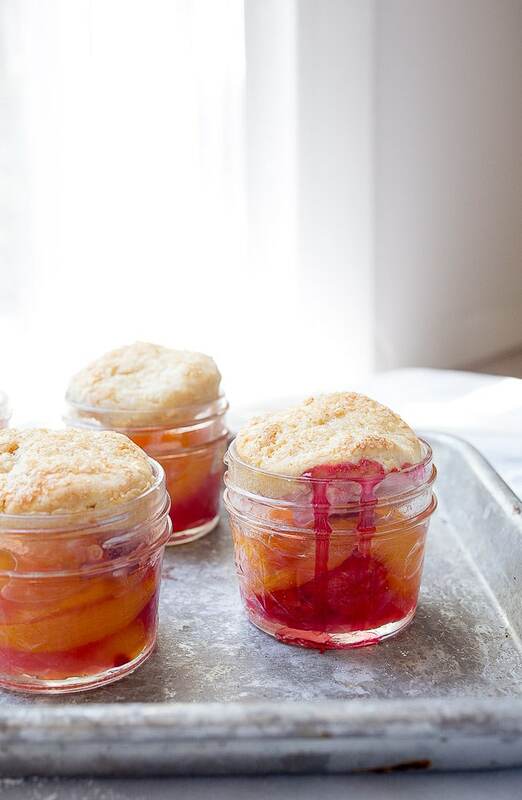 Mini mason jar cobblers--raspberry peach flavors. So portable! Preheat the oven to 425, and have 4 mini mason jars ready (4-ounce size). Remove lids and set aside. First, peel, pit and slice the peaches into 1/4” slices. 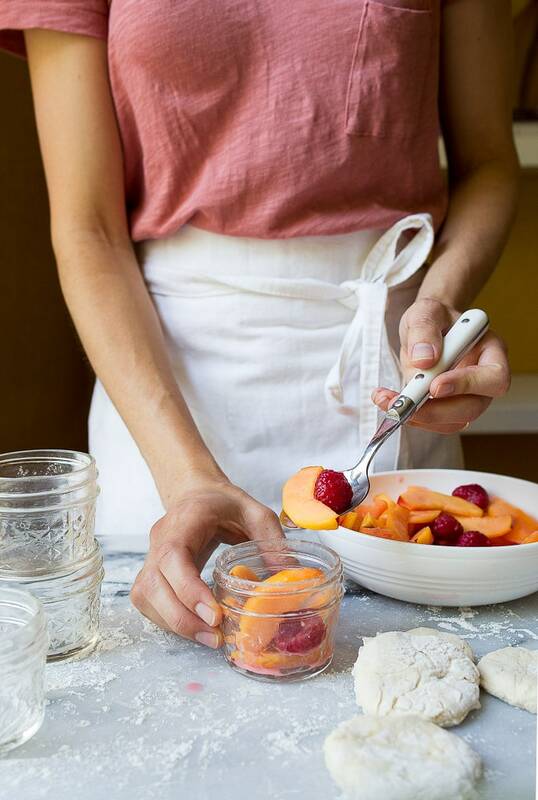 Add them to a bowl with the raspberries, sugar, cornstarch, and almond extract. Stir very well, and then set aside. In a small bowl, whisk together the flour, baking powder, baking soda, and salt. Add the butter to the mixture, and work it until it’s the size of peas. Use a pastry blender or your fingers to smush the butter evenly throughout the flour. Next, in a small measuring cup, whisk together the almondmilk, lemon juice, and lemon zest. Pour this over the flour mixture, and stir until a wet dough forms. Place the dough on a floured surface, and knead a few times to bring it together. Pat the dough out into a 6” square, and use the mason jar to cut out 4 circles of dough. 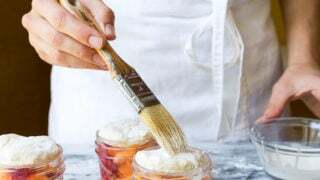 Divide the fruit mixture evenly between the mason jars, and top with the dough circles. Brush with extra almondmilk, and sprinkle with coarse sugar (if using). Bake for 20 minutes, until the biscuits are golden brown and the fruit mixture is bubbling. hmmm, I’m thinking cheesecake and tiramisu and banana pudding would be cutie pie mini purse desserts. But I guess you’d have to know they were there (duh) and eat them shortly after leaving the house (not hard). I picked up the greatest serving triple chocolate mousse cake with thick chocolate ganche from a bakery last weekend to take on a picnic supper by the lake. That would also be tremendous! Lemonade icebox pie? What can’t a mason jar do? What about a mason jar cake to go? With frosting of course. Or maybe mini trifles? The rice krispy treats sounds perfect, any snack that can be eating faster because its in stick form is good in my book. Hello chocolate covered pretzel rods. :-) I have often wanted to try it with brownies, but don’t think it would pass the purse test. I think that should be the focus of your next book. Purse dessert, what every modern day woman should always have on hand. Oh my! This…is….pure….GENIUS!!!! Heading to the kitchen now….I think my life is forever changed!! ???? I’ve made mason jar trifle (https://www.thebasilandcinnamonsagas.com/home/red-white-and-blue-mason-jar-trifle) and I just have to say….they have serious purse dessert potential :) Especially if you make them in those mini-mason jars pictured in this post! Mason jars = so very portable = perfect dessert transport! PS: On the same line as cookies, I would not suggest brownies as purse desserts. Especially not brownies with toasted coconut on top. I made that mistake three months ago, and I’m still shaking coconut and chocolate out of my bag every time I reach for my wallet. I don’t know how it’s possible, I’ve cleaned it like three different times, and yet–can I interest you in aged choco-coconut crumble, random stranger in line at the grocery store? Yeah, didn’t think so. annnnnnnnnnnd, what parks do you go to????? hey girl- this looks so yummy! I am so a dessert person to! Hi Christina, Did you say you were a dessert purse-on? Haha… :) Thank you so much for sharing this great recipe and blog post! Hope you and your family get some good rest in the midst of all your summer activities. Awesome recipe thanks, If you find yourself using a lot of almond milk, you should try msking your own all you need is almonds, water, high speed blender and a nut milk bag, youbwill be blown away at the difference and no fillers. I may have to try this since I’m lactose intolerant and also afraid of buying lactose free milks because of trying them about 14 years ago and going YUCK!! This will get me to definitely try it again and hopefully cut some milk out of my diet because yeah it’s a pain (literally). Hi Christine- I absolutely love your small batch recipes. My husband and I went from a family of seven to empty nesters feeding two. It’s so hard to find recipes, especially desserts, that don’t make enough to feed an army. And many desserts don’t freeze all that well. My married childless daughter also loves your recipes since it’s just enough dessert for her and her husband. Could the raspberry peach cobbler be made with regular milk instead of almond milk? I have a nut intolerance so milk would be much kinder to my tummy. Hi Sharon! thanks for writing! And thanks for the sweet words! So glad we met!